Senate Bill 1 requiring tightened school security is making its way through the legislature. Presently it is expected to cost state and local communities more than $10 million. Questions abound about where to get the money. Governor Pence wants a state income tax, while legislators have other priorities for the state's tax revenues. I, however, have a source for the money - civil forfeiture, a subject I've written on several times. Indiana law provides that at the conclusion of civil forfeiture proceedings, once matters regarding the civil forfeiture defendant are disposed of, a judge has to make a determination of the law enforcement costs for that particular case. The law enforcement agencies get paid for those costs and a check for the balance goes to the Indiana Common School Fund. Presently virtually every prosecutor in the state that uses civil forfeiture is blatantly violating the law by pocketing 100% of the money as law enforcement costs. Because civil forfeiture proceedings are one-sided when they reach the disbursement of money stage, judges are simply going along with whatever the prosecutor tells them, i.e. judges are not enforcing the law probably because there is no one to advocate for the schools to get their cut of the money in the courtroom. In Marion County alone civil forfeiture amounts to over $1 million a year. That figure is before civil forfeiture was substantially expanded under new prosecutor Terry Curry. Curry, like Brizzi, is simply keeping all the money for law enforcement agencies. There is also a separate issue of whether any civil forfeiture money can be diverted for law enforcement costs since the Constitution mandates that the Common School Fund be made up of "all civil forfeiture." While Attorney General Greg Zoeller has issued an advisory opinion supporting prosecutors on the diversion of law enforcement costs pursuant to state law (and even that is not being followed), his opinion is pretty universally derided as simply being a favor to prosecutors, and not good legal analysis. Near the end of the deliberations on the bill though in 2011, the Indiana Supreme Court took the unusual step of opining in an unrelated civil forfeiture case that didn't (and couldn't because civil forfeiture defendants don't have standing to raise the issue), that any diversion of money to law enforcement could well be unconstitutional. (See Indianapolis Star link to the story at bottom of page.) Still a constitutional challenge on that issue is a ways down the road because it is so hard to find a plaintiff who won't be subject to a stringent challenge on standing. The Indianapolis Star has written several articles detailing the abuse of civil forfeiture in this State. There is a way to bring a stop to these abuses - direct the money to a school security fund. The legislature discussed this a couple years ago when Education Superintendent Tony Bennett unwisely cut a deal with Zoeller (who is very close to the state's prosecutors) that the civil forfeiture law would be revised so that law enforcement keeps 85% and schools get 15% and that 15% had to be used for school security. It was an inexplicably lopsided deal for education when law enforcement costs are at the very best average 50% of the amount collected from civil forfeiture. The bill passed the legislature but then was vetoed by Governor Mitch Daniels. It would be best if the legislature simply followed the "all forfeiture" language of Indiana's Constitution and repealed the civil forfeiture statute completely. But as long as the civil forfeiture statute is going to exist, the incentive for law enforcement abuse of the procedure should be removed by taking the money away. 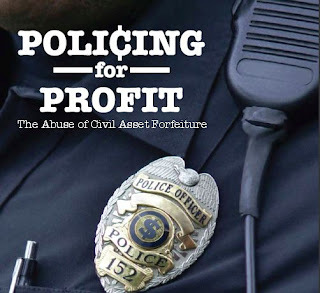 Giving the civil forfeiture proceeds to the schools for school security would eliminate the incentive for law enforcement abuses carried out due to the profit incentive associated with civil forfeiture. Prosecutors and law enforcement officials should not be above the law when it comes to complying with Indiana's civil forfeiture law. But presently they are. The Indianapolis Star has written numerous articles on civil forfeiture, including documenting abuses. Some may be stll be available via a search of the archives. I found this one discussing the Supreme Court opining on the subject. Numerous other articles talking about the problems with Indiana civil forfeiture law can be found via general searches.